We’d love your help. 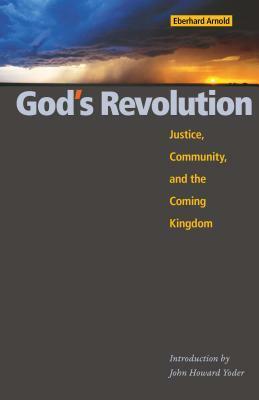 Let us know what’s wrong with this preview of God's Revolution by Eberhard Arnold. Do you feel powerless to change the injustice at every level of society? Are you tired of answers that ignore the root causes of human suffering? This selection of writings by Eberhard Arnold, who left a career and the established church in order to live out the gospel, calls us to a completely different way. Be warned: Arnold doesn't approach discipleship as the route to Do you feel powerless to change the injustice at every level of society? Are you tired of answers that ignore the root causes of human suffering? This selection of writings by Eberhard Arnold, who left a career and the established church in order to live out the gospel, calls us to a completely different way. To ask other readers questions about God's Revolution, please sign up. As I wrote in a review for "Why we live in community" by the same author, this is a priceless book. It features excerpts out of his other works, however, so one should understand that they are only going to get 'glimpses' into his thoughts, quite profound at times. Of course, that might be a real plus to some readers who appreciate being able to grab a bit of a thought and think about it all day (I have, many of those thoughts are still with me months later!). You should know that Eberhard Arnold As I wrote in a review for "Why we live in community" by the same author, this is a priceless book. It features excerpts out of his other works, however, so one should understand that they are only going to get 'glimpses' into his thoughts, quite profound at times. Of course, that might be a real plus to some readers who appreciate being able to grab a bit of a thought and think about it all day (I have, many of those thoughts are still with me months later!). You should know that Eberhard Arnold's books are offered complete in digital format online and so one need not 'buy' them unless that is preferable to you. Either way, he has my highest recommend as a writer for Christians trying to live authentically with others in church and community. I read TONS of these kind of 'church' (ecclesiology) books and this one is PRICELESS. If churches and believers absorbed and practiced only a few thoughts from this book (not to mention the NT :–) the church would be transformed! Why he is not better known is anyone's guess,...Maybe because he wasn't American, or because his community was pretty radical and shared everything. Maybe because some today have criticized the current day movement as being controlling or cult-like. I cannot speak to those criticisms except to say that regardless of the current movement, eberhard NEEDS to be reread in our day. Esp. as the church seeks to be relevant and engage again, they need to consider wat they are offering the world when are not even sharing the Life with one another. Because of their pietistic heritage I have a genuine love and appreciation for the Bruderhof and their focus on peace, justice, and intentional community. There are some wonderful passages in this collection, although as a whole it is a bit uneven. very focused book and challenging to read. Eberhard was born in Königsberg, East Prussia into an academic family. He studied theology but, because of his views on infant baptism and his decision to leave the Lutheran church, he was refused his degree. He changed majors to philosophy. He married Emmy von Hollander and together they dedicated their lives in obedience to God’s will. This led to the beginning of community in 1920. Eberhard was Eberhard was born in Königsberg, East Prussia into an academic family. He studied theology but, because of his views on infant baptism and his decision to leave the Lutheran church, he was refused his degree. He changed majors to philosophy. He married Emmy von Hollander and together they dedicated their lives in obedience to God’s will. This led to the beginning of community in 1920. Eberhard was criticized for his uncompromising faith, which cost him many friends. Not wanting to form a separate sect, he always sought out others who felt as he did. This led to a year’s trip to North America (1930-31) to visit the Hutterites. He was accepted as a minister and the Bruderhof became part of the larger Hutterian movement.